MONEY IS ENERGY – SO GIVE YOUR ENERGY TO BUSINESSES AND PEOPLE WHO CARE ABOUT THE SERVICES AND PRODUCTS THEY OFFER. TOGETHER, WE CAN MAKE THE WORLD A BETTER PLACE FOR ALL. SEARCH BELOW FOR MEANINGFUL EXPERIENCES AT YOUR NEXT DESTINATION. HAVE SOME TO ADD? PLEASE SHARE YOUR WISDOM WITH US HERE! SEARCH BELOW FOR VEGETARIAN-FRIENDLY RESTAURANTS THROUGHOUT THE GLOBE. WE ALSO LOVE AND SUGGEST THE HAPPY COW APP AND WEBSITE! GO SEE LIVE MUSIC! WHETHER YOU PLAY, DANCE OR JUST APPRECIATE, CHECK OUT THESE MUSICAL VENUES FOR THE OPPORTUNITY TO ENJOY INSPIRATIONAL PERFORMANCES OF TALENT ALL OVER THE WORLD. CONNECT WITH YOUR SPIRITUAL TRIBE ANYWHERE IN THE WORLD BY TAKING YOGA CLASSES. PRACTICE AT THESE RECOMMENDED STUDIOS. MANY OFFER DISCOUNTS FOR FIRST-TIME STUDENTS, AND DIFFERENT TEACHERS ADD RICHNESS TO LIFE. MANY FUN EXPERIENCES IN THE WORLD DON’T NECESSARILY COST MONEY. ENJOY THESE MEMORABLE ADVENTURES. EXPLORE DIFFERENT CULTURES, OUR NATURAL ENVIRONMENT AND, AS A RESULT, OURSELVES. USA Florida Fort Pierce S&S Takeout https://www.facebook.com/TheSSTakeout/ The menu changes daily, so find them on Facebook or sign up for their newsletter to see what's cooking. USA Florida Orlando Ethos Vegan Kitchen http://www.ethosvegankitchen.com/ Bring your non-vegan friends and watch them devour everything they order. USA Florida Orlando Stardust Cafe https://stardustvideoandcoffee.wordpress.com/ Great selection of tea and beer, with lots of cool events each week. Check out Punslingers. USA Florida Stuart District Table https://www.districttableandbar.com Some of the best dining in town, with many ingredients locally sourced. USA Florida Stuart Ian's Tropical Grill http://www.ianstropicalgrille.com_ Call ahead if ordering vegetarian food and for reservations. USA Florida Jensen Beach Mary's Gourmet Kitchen https://www.facebook.com/pages/Marys-Gourmet-Kitchen/121056844627843 Cash only! USA Florida Stuart Tabuleh Cafe/Planet Ozone http://planetozone.com/ Don't let the fact that it's in a gas station fool you. This restaurant serves the best Mediterranean food on the Treasure Coast. Juice bar is also great, but the service is very slow. Great Sunday brunch, too! USA Pennsylvania Lancaster The Flour Child http://theflourchild.com/ Check if they are open before driving out to Columbia, but the drive is worth it for vegan cakes and desserts. USA Pennsylvania Lancaster Maison http://www.maisonlancaster.com/ The menu says almost anything can be vegan or vegetarian, so test 'em! USA Pennsylvania Lancaster On Orange https://onorange.wordpress.com/ Vegan sausage? Vegan pancakes? Happy Sunday! By the way, it's only open Friday-Mondays so pick another spot when playing hooky. USA Pennsylvania Lancaster Upohar http://www.upoharethniccuisines.com/ A great place for vegetarian catering! USA Puerto Rico Luquillo Boardriders http://www.boardriderssurfbarandgrill.com/ Sit outdoors and chill at this spot before or after surf. USA Puerto Rico Viejo San Juan Marmalade http://www.marmaladepr.com So many creative vegetarian options make it fun to share multiple courses. Don't forget the wine! USA South Carolina Charleston Black Bean Co. http://www.blackbeanco.com/ Always fresh! Great lunch place. The Bahamas Abacos Elbow Cay Firefly http://www.fireflysunsetresort.com Homemade veggie burger and their vegetable stack are excellent! For a treat, try one of their specialty cocktails with Firefly vodkas. DOMINICAN REPUBLIC Puerto Plata Cabarete Fresh Fresh Cafe https://www.facebook.com/freshfreshcab/ Can't go wrong here, whether you come after an early surf to chow or need a healthy smoothie after a night of boozing with friends. USA VIRGIN ISLANDS St. Thomas SOS Cafe & Bar https://www.facebook.com/freshfreshcab/ Be careful parking in their small lot! Then grab a table, a cup of coffee and a glass of water from the self-service bar and relax. You're about to get the freshest meal and more creative cocktails on island. Points if you're a lesbian (Slits Over Stalks). NEW ZEALAND South Island Queenstown Yonder https://www.facebook.com/freshfreshcab/ Sit outside at sunset for fresh air. Fill up on the quinoa Ð if you're lucky you've just jumped off a bridge or hiked a big hill to see an epic vista. Get dessert. NEW ZEALAND South Island Moteuka Toad Hall Store & Cafe https://www.toadhallmotueka.co.nz/ A must-go for breakfast or vegan ice cream, Toad Hall also hosts some great live music on their outdoor patio. But beware, no wifi! NEW ZEALAND South Island Nelson East Street Vegetarian Cafe and Bar https://www.facebook.com/Eaststeatsandbeats/ Dishes are creative and filling, but we dunno ... those chickpea "chips" could be passed over. NEW ZEALAND North Island Raglan SolScape http://www.solscape.co.nz/ Whether you are staying in one of the sweet hostel beds, getting surf lessons and renting boards or taking a yoga class, you might as well stick around for awesome coffees and a delicious vegan meal. MALAYSIA Penang Georgetown Pin Xin https://www.facebook.com/freshfreshcab/ Noodle bowls are amazing and cheap. If you can wait the 30 minutes for the epic homemade vegan burger, your tummy with thank you. Try the butterfly pea tea! MALAYSIA Penang Georgetown Woodlands https://www.tripadvisor.com.my/Restaurant_Review-g298303-d5439256-Reviews-Woodlands_Vegetarian_Restaurant-George_Town_Penang_Island_Penang.html The dosais are a must-try, and everything is delicious. MALAYSIA Penang Georgetown Thali NR Sweets https://www.facebook.com/NR-SWEETS-163488630377516/ Enjoy a platter and juice, and then pick out some authentic Indian sweets to go. MALAYSIA Penang Georgetown Wholey Wonder https://www.facebook.com/Eaststeatsandbeats/ They kinda already had us with the cute yoga studio upstairs, but that Superfood Smoothie Bowl -- a smoothie served in half of a papaya -- sealed the deal. 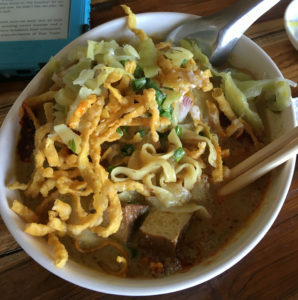 MALAYSIA Penang Georgetown Lagenda House & Cafe https://www.facebook.com/cafelagenda/ There are many creative vegetarian options, but the Sayur Lodeh Masam Manis really blew us away. THAILAND Chiang Mai Old City GoodSouls https://www.facebook.com/goodsoulskitchencm/ Mango smoothie bowls are divine. If you are hungrier, the tofu bowl and toast is the answer. THAILAND Chiang Mai Santitham ImmAim Vegetarian and Bike Cafe https://www.facebook.com/ImmAimVegetarianCafe/ Arrive before 8 p.m. to be served Ð the rush is worth it. THAILAND Chiang Mai Nimman The Salad Concept http://www.thesaladconcept.com/about.php There's another location just west of the Old City. Huge, fresh salads made to order! THAILAND Chiang Mai Old City Free Bird Cafe https://www.facebook.com/FreeBirdCafe/ Proceeds support refugees so come hungry, then check out the thrift shop and reuse items for sale. THAILAND Chiang Mai Old City Khunkae's Juice Bar https://www.facebook.com/Khunkaes-Juice-Bar-1689961967906460/ Opens at 10 a.m., so wander over from Hidden House Yoga Studio after the free meditation. THAILAND Chiang Mai Old City By Hand Pizza Cafe https://www.facebook.com/byhandcafe/ An entire menu of vegan pizza options (along with many stone-fired classics)! Sized for sharing. KOREA Incheon Songdo Kyla's Kafe https://www.facebook.com/Kylas-Kafe-105532393379839/ Vegetarian options are rare in Korea, so keep a look out for this pop-up restaurant's events! ARGENTINA Mendoza Villa 25 de Mayo Color Cafe https://www.facebook.com/freshfreshcab/ Julie and Christopher speak English, Spanish and French and make the most delicious food in the quaint Villa 25 de Mayo outside San Rafael. USA Florida Jupiter Guanabana's http://www.guanabanas.com/ Beautiful, intimate venue for free, live music in Jupiter, but the sound curfew is serious: Bands end at 11 p.m. on the dot. USA Florida Orlando Tanqueray's https://www.facebook.com/Tanqueraysbar This is a cool underground bar with local and national acts. Good craft beer selection. USA Florida Orlando Will's Pub http://www.willspub.org/ Great music, great craft beer Ð what more do you want? USA Florida Stuart coffee house Blue Door http://www.coffeebarbluedoor.com/ Intercoastal Swell and other local bands make the lovely outdoor courtyard come alive. Movie nights are fun too. USA Florida Stuart Terra Fermata http://www.terrafermata.com/ Excellent micro brews on tap and the best bands, both locally and from around the nation. USA South Carolina Charleston The Pour House http://www.charlestonpourhouse.com/ This is 'the" place to see live music in Charleston. 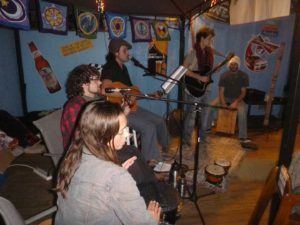 Check out their Dead on the Deck on Wednesdays for a heady scene. USA Puerto Rico Viejo San Juan Nuyorican Cafe http://www.nuyoricancafepr.com/ Ask the bartender for the specialty of rum, coconut milk and cinnamon. It's a healthy version of a coquito and is perfect after dancing. USA New Mexico Santa Fe Meow Wolf https://meowwolf.com This amazing interactive, psychadelic art project should NOT be missed when in Santa Fe or anywhere close. Add music in the mix and mindblown. USA New Mexico Santa Fe Santa Fe Brewing Company https://santafebrewing.com They created a ginger ale after we visited? Just another reason to return to this fun indoor venue. THAILAND Chiang Mai Old City North Gate Jazz Co-Op https://www.facebook.com/northgate.jazzcoop/ Stick to beer. Cocktails are kind of weak. And dance! USA Florida Jacksonville Prana Yoga http://pranayogaorangepark.com/ Says our friend in the know, "New business with a great owner who is really trying to make this studio a positive part of the community"
USA Florida Jupiter Kula Yoga Shala http://www.kulayogashala.com This groovy little donation-based studio also has a great gift shop and cafe. USA Florida Jupiter Green Tara Yoga http://greentarayoga.net Classes are just $10. Try the Reggae Yoga or Chair classes. USA Florida Port St. Lucie Down to Earth Yoga Studio http://downtoearthfitness.wix.com/downtoearthfitness%E2%80%8B If you are new to Yoga, check out Meliss's beginner classes. USA Florida Stuart Flagler Park Yoga https://www.facebook.com/ExhalewithGrace/ Donation-based Yoga in the park downtown on Saturdays, 8:30 a.m.! USA Florida Stuart YogaFish http://yogafishstuart.com/ Come early to grab a spot on the floor of this small but popular studio. USA South Carolina Charleston Charleston Community Yoga_ http://www.charlestoncommunityyoga.com/ Cheap, great classes. Sign up for their e-newsletter to stay up to date. USA South Carolina Charleston Holy Cow Yoga Center http://www.holycowyoga.com/%E2%80%8B Great vibes at this studio, located across from Earth Fare (https://www.earthfare.com/our%20stores/charleston), a super-yummy grocery store. USA New Mexico Santa Fe Santa Fe Community Yoga http://www.santafecommunityyoga.org They've got a great deal for new students, so buy the package. NEW ZEALAND South Island Queenstown Studio Sangha http://queenstownyoga.com It's located in an industrial centre, so it's a little tricky to find but you will if you are keen. THAILAND Chiang Mai Old City Wild Rose Yoga http://www.wildroseyoga.org The fascia release classes are intense and amazing. Perhaps skip the "water flow" unless it's Songkran. THAILAND Chiang Mai Old City Hidden House Yoga https://hhyogachiangmai.com Free guided meditation should be in your weekly habit, as well as the great open mic nights. THAILAND Chiang Mai Old City Yoga In The Park https://www.facebook.com/groups/289951174859604/ Check the Facebook group to make sure the free 9 a.m. class in Nong Buak Hard park. MALAYSIA Penang Georgetown Wholey Wonder https://www.facebook.com/wholeywonder/ This spot in the Hin Bus Depot also has a fantastic vegan cafe with yummy smoothies for after class. KOREA Incheon Songdo Asteya Yoga Studio https://www.facebook.com/AsteyaYogaSongdo/ They often hold lovely yoga classes in the pavilion in Michuhol Park. USA California San Francisco Muir Woods http://www.nps.gov/muwo/index.htm You must get a parking reservation or reserve a shuttle in advance! Go to: https://gomuirwoods.com/ and enjoy. USA Colorado Boulder Hiking the Flat Irons https://bouldercolorado.gov/osmp/flatirons-vista-trailhead Start at the corner of 9th and Baseline Road, bring water and enjoy this moderate hike! USA Colorado Colorado Springs Manitou Springs http://manitousprings.org/ This little town near Colorado Springs is not to be missed! Be sure to sample the sparkling waters that flow freely throughout this sweet little town. USA Colorado Colorado Springs Garden of the Gods http://www.gardenofgods.com/home/index.cfm?flash=1 This place gets packed but it sure is worth it! USA Florida Marathon Bahia Honda State Park http://bahiahondapark.com/ Think ahead if you want an epic beachfront camping spot Ð they book out a year in advance. Luckily it's perfect for the day. USA Florida Jacksonville Riverside Arts Market_ http://riversideartsmarket.com/ Popping up under the interstate every Saturday is a cool place for art and music. USA Florida Ocala Ocala National Forest http://www.fs.usda.gov/main/ocala/home Centrally located in the state, this huge gem is worth a trip! We recommend camping in Juniper Springs or Salt Springs, but you can't really go wrong. Rent a kayak, swim in the 72-degree springs and relax! USA Florida Orlando Audobon Park Farmers Market @ Stardust http://www.yelp.com/biz/audubon-park-community-market-orlando Taking place on Monday nights, this is a great place to meet people and check out local goods from local folks. USA Florida Orlando Lake Eola Park http://www.cityoforlando.net/parks/lake-eola-park/ Check it out at night! 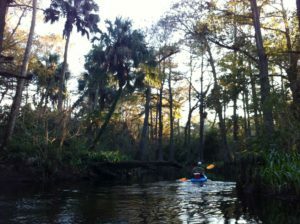 USA Florida Orlando Wekiva Springs http://www.tripadvisor.com/Attraction_Review-g29171-d145739-Reviews-Wekiwa_Springs_State_Park-Apopka_Florida.html Looking for real adventure? Try backcountry kayak camping here! There's also great day kayaking, picnicking and swimming, too. USA Florida Orlando Blue Springs http://www.bluespringspark.com/ Great kayaking and picnic area. USA Florida Palm Beach Bike trail on Palm Beach island http://www.floridarambler.com/florida-bike-hike-trails/lake-trail-palm-beach-paved-bike-trail/ Rent a bike at Palm Beach Bicycle (www.palmbeachbicycle.com/) for free parking, a map and a quick trip to Publix for a picnic lunch. USA Florida Stuart Downtown Green Market http://stuartgreenmarket.org/ Sunday mornings along the St. Lucie River are beautiful. Stick around downtown for free live music at the Riverwalk in season. The farmer's market in Fort Pierce (http://www.fortpiercefarmersmarket.com/) is even bigger. USA Florida Jensen Beach Hawk's Bluff Trail http://floridahikes.com/savannas-preserve-hawks-bluff Easy 1-mile hike is great for families, dogs and lunchtime escapes. USA South Carolina Charleston Surfing on Folly Beach http://www.mckevlins.com/ Rent a board (or pick up wax) at McKevlin's Surf Shop and talk up the locals about the best spot. Plenty of free parking. USA Puerto Rico Fajardo Bioluminscent Bay http://www.kayakingpuertorico.com/pages/biobay.html Spots for these popular tours fill up fast, so reserve a spot early. If they are filled up, ask for other tour companies. USA Puerto Rico East Side El Yunque National Forest http://www.fs.usda.gov/elyunque The trails are pretty packed, so check out the waterfalls during off times or keep expectations low. The Bahamas Abacos Sandy and Fowl Cays Snorkeling http://www.friendsoftheenvironment.org/ There are wonderful underway national parks throughout the Abacos, thanks to maintenance by volunteers who keep moorings safe. Never anchor here to protect the reef! The Bahamas Abacos Lubbers Quarters Moonrise https://www.facebook.com/moonriseforromance/?pnref=lhc Escape for a week or weekend in this romantic, beachfront eco-lodge. The Bahamas New Providence Nassau Sivananda Yoga Retreat https://www.sivanandabahamas.org/ Check the schedule for interesting workshops and book a tent hut for a transformative retreat with plenty of yummy vegetarian food and yoga! USA New Mexico Santa Fe Santa Fe Bandstand https://santafebandstand.org Free live music and dancing in the center plaza works up an appetite. Head to The Plaza Cafe afterward. New Zealand South Island Christchurch Hagley Park https://www.ccc.govt.nz/parks-and-gardens/explore-parks/hagley-park-and-gardens/ Grab a flat white and check out the free live music on Sundays. MALAYSIA Penang Georgetown Street Art Walk http://thenextsomewhere.com/2017/07/11/walking-tour-street-art-in-penang/ When the sun gets too hot, dip into the Junk Cafe (https://www.facebook.com/junk401/) on Chulia for a passionfruit mojito. THAILAND Chiang Mai Doi Suthep Monk's Trail https://www.alltrails.com/trail/thailand/chiang-mai/don-suthep-monk-trail This is a big hike, bring plenty of water. Enjoy the temples along the way and at the top!